Mankato WTP | ProMinent Fluid Controls, Inc. 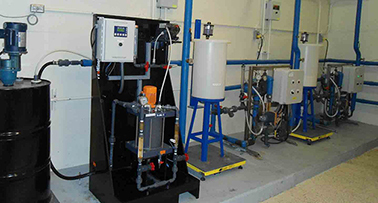 The City of Mankato, MN Water Treatment Plant staff elected to install a new polymer blending and mixing system that provides efficient polymer activation through a 3-stage mixing system. The existing polymer system had poor mixing and inadequate activation, as well as a number of maintenance issues that cost the City time and money. For 18 months, the new polymer system treated one softening reactor, while the older system continued to treat the other reactor. This provided plant management the opportunity to observe, first-hand, the advantages of programmed 3-stage mixing under normal, day-to-day operating conditions. During the initial 18 months operating the new system, the plant witnessed a significant reduction in polymer use, equating to smaller polymer doses, while also achieving improved settling of solids in the plant’s softening reactor, especially at higher flows. Mankato, population approximately 40,000, receives raw water from two surface wells and two deep wells. The water treatment plant, which is operated 24/7, has a rated capacity of 12 MGD and average production of 5.5 MGD. Water enters the plant from the well field through a 24-inch line to two softening reactors. Following hardness removal, the water enters a recarbonation basin before the water is directed through ultra-filtration membranes. After filtration, chlorine and fluoride are added before the finished water flows into reservoirs and is then pumped into the city’s distribution system. The plant’s two softening reactors provide 3-stage lime softening – including rapid mix, gentle mix and clarification, all carried out in a single tank separated by baffles. Emulsion polymer is used as a flocculation aid and is added simultaneously with the lime and raw water as it enters the plant. The older, existing polymer preparation systems consisted of three in-line polymer mix/feed units, two on duty and one for backup. From the beginning, operators had struggled to consistently make proper polymer solutions with this system. The single-stage unit had been initially set up so that a diaphragm metering pump would pull the emulsion polymer directly from a 55-gallon drum. However, the pump serving it wasn’t big enough to deliver the sufficient suction lift necessary to pull the product out of the drum and into the pump. As a workaround, the plant installed three 15-gallon day tanks positioned hydraulically above three pumps, relying on the raised height to provide the needed flooded suction. Using this setup, the plant pumped emulsion polymer out of the 55-gallon supply drum into the three day tanks. With this modification, there continued to be problems and inefficiencies with the system. Although the 55-gallon drum has mixing capability, the day tanks did not, so the polymer was susceptible to separation. The day tanks were covered but not sealed, so moisture intrusion was a potential problem that could cause further inefficiencies if the polymer coagulated. Coagulated polymer (poly with moisture) tends to plug the chemical feed pumps requiring disassembly and cleaning of the pumps. The modification allowed for the existing blending and feed system to achieve the pounds of polymer required at lower plant flows. However, consistent performance remained problematic at higher flows. In addition, the system was maintenance intensive, including frequent ejector replacement at $300 for each failure. The mixing units had problems with plugging, and pump parts require frequent replacement. Maintenance personnel had to perform a complete take-down of the system every month, including the mixing units and pumps (ball valve and check valve replacement), pump recalibration and day tank clean-out. The plant spent more than $1,500 a year on parts for the existing system, and more than $2,000 in estimated staff labor to maintain it. plant’s softening reactors while the existing polymer system serves the other softener/clarifier. The reduction in polymer consumption with the ProMix unit compared to the plant’s existing system proved significant during the performance trial. Its robust operation and ease of use was also apparent. Based on the highly positive performance results during the trial, Mankato elected to purchase the unit and continue evaluating the plant’s polymer usage and associated system performance. The ProMix-S system is designed with three specific zones of polymer activation (see illustration, right), compared to the plant’s older unit which had only a single zone. The first polymer activation zone (A) provides high mixing energy to achieve the successful initial wetting of the polymer to prevent fisheye formation. The second zone (B) provides medium mixing energy to provide optimum mixing without damaging the expanding polymer chains that have been activated and are very fragile at this stage. The third zone (C) reduces the mixing energy even further, providing very gentle mixing to ensure that the polymer solution becomes fully homogeneous. The three-zone activation system also provides for slightly longer retention time prior to use. The ProMix-S provides LCD display (including primary and secondary flow display) with touchpad control. It has remote start/stop and programmable auto-flush. The new system serving the water plant provides 4-20mA input to pace the pump as well as provide connections for Ethernet communications and datalogging. The unit is connected into the plant’s SCADA system, and polymer dosing changes with the plant’s flow. The new system reduced polymer usage by 20% during head to head pilot testing. 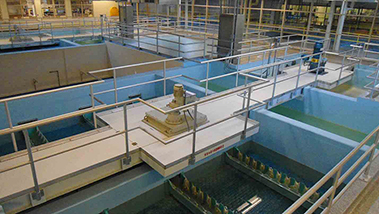 The clarifier also achieved better settling of solids in the softening reactor that is being served by the new unit. This had always been problematic with the older unit at higher flows. Based on the results of the trial, we estimated an approximate 14-month payback on the purchase of the new system, based on parts, labor and polymer savings. When a softener was taken out of service, the staff would switch over to the new polymer system to serve whichever reactor was operating. In the summer the plant typically runs both softeners. In the winter, however, sometimes only one reactor is run at a time and polymer was directed there from the new blending and delivery unit. The new polymer unit has not been taken out of service since it was pilot tested. The system required very little adjustment and remained well calibrated. The plant has not yet had to change out the pump’s peristaltic hose, change out the neat seat, or the check valve into the mixer since July 2012. After 18 months usage of the new system, the plant has purchased two additional ProMix-S units, due to the high efficiency gained and quick return on investment. The two new polymer systems will further decrease maintenance issues and reduce polymer usage while helping with operations and management of the facility. 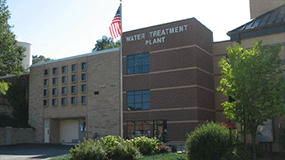 Overall, the system has proven to be a reliable and cost effective polymer feed solution for Mankato, MN.